6mmBR.com Reviews of Reloading tools, Bipods Harris Pod-loc, Cleaning Supplies, Redding Wilson Dies, K&M Tools, Neck turning Tools, Shooting Accessories and supplies. We found this cleaning pad (item AX8A-85517) in the latest Sportsman's Guide catalog. This will help to protect the finish of your firearms while you're working at your bench. 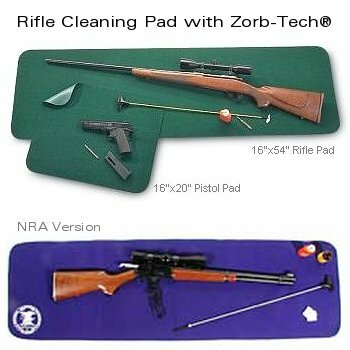 The 16"x54" Rifle Cleaning Pad uses a unique Zorb-Tech® fabric to absorb oils and solvents. Waterproof backing prevents chemicals from soaking through to your bench-top. The fabric has a soft, felt-like nap that is gentle on your gun's finish and won't scratch precision metal parts. Made in the USA, these stain-resistant pads are machine washable and dryable. Priced at just $11.97, this pad is a useful addition to any loading bench. Sportsman's Guide also offers a 16"x20" Handgun Cleaning Pad, item AX8A-85517, for $6.97. This is highly functional product for all long-gun shooters. Even the NRA thinks so. The same pad, with Navy blue Zorb-Tech® fabric and white NRA logo is sold by the NRA Store for $12.50 (item 21581). The soft, plush fabric stops small parts from rolling away and getting lost. A white NRA seal is silk-screened in the left corner. The NRA store also sells a blue 16"x20" Pistol Pad for $9.50.